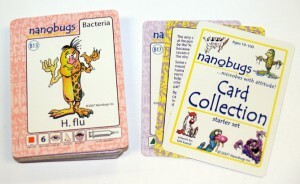 NANOBUGS is an extremely well drawn card game with terrific cartoon characters that give life to the microbes in the world and teach us all how to learn how to live in harmony with them. 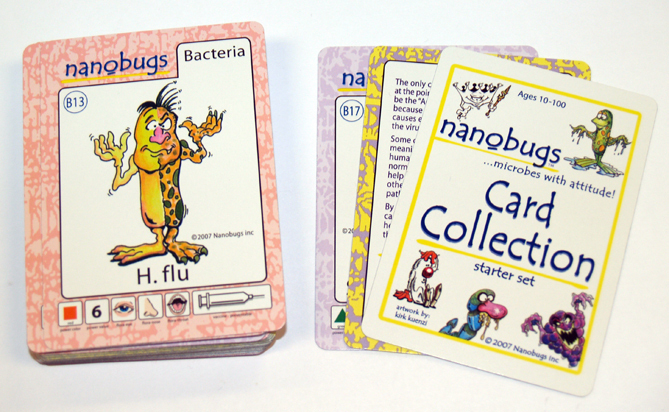 These fun cartoon characters are called “nanobugs” and they provide an effective teaching tool for introducing elementary and middle school students to microbiology/virology. The bacteria and fungi are morphologically-correct and the information on the collectible cards is written for this age. The power color and power value were determined based on the virulence, pathogenicity, antimicrobial resistance and treatment. In the future, a set of collectible cards will be developed for health professionals, collegiate biology students, and students in the health professions. These cards will utilize more medical and scientific terminology and will have more detailed information. Be sure to check out the Infection Information Sheets on the Kids page of the website. These sheets can be utilized as content for health promotion components of the curriculum for elementary students. One school system used these sheets as the content resource for a poster contest focused on infection prevention for their health promotion week. What’s Your COSMO? TM card game is a new generation of playingcards with a “cosmic twist”. It’s the card game with the most games to play! Choose between seven unique card games using double-sided playing cards, two different wild cards, positive and negative signs, letters, and five title cards. The object of each game involves making triples, straights, equations, or completions. Two games challenge players’ math skills using positive and negative integers. 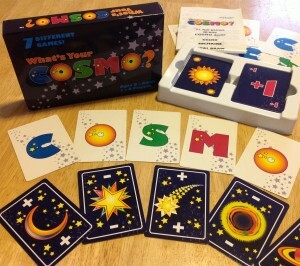 In addition, the COSMO game system provides plenty of space for ingenuity to create and design fun, new games. The possibilities are endless. For 1-6 players, ages 8 to 80, there’s a COSMO for everyone. Enter the galaxy of fun and challenge. So… What’s your COSMO? 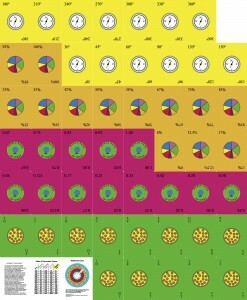 Clockwork – teaches decimals and fractions by associating them with the clock face – simply amazing! 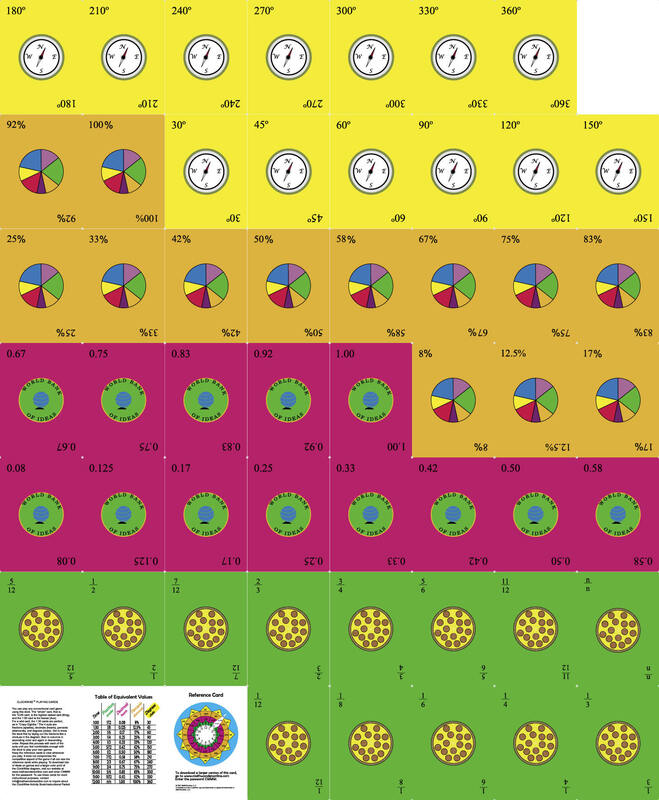 ClockWise is a fun and easy way to visualize and compute fractions, decimals, percents and angles on a clock face! All lessons are written in a simple, 1-2-3 format, so it is EASY TO TEACH, and NO TRAINING is necessary. Plus it is TONS OF FUN! FROM AN EDUCATOR: On a personal note, I have been involved in the field of education for over 30 years, and involved with materials development since 1994. I have grown skeptical of all educational statements that claim to ‘revolutionize’ the industry, because in almost every case, the ‘revolutionary’ concept turns out to be a slightly different strategy with new vocabulary attached. For example, ‘No Child Left Behind’ used to be called ‘Goals 2000’. Before ‘Goals 2000’, it was called ‘Educational Reform,’ which was a new word for ‘Restructuring’. Over the years, I have also grown skeptical of programs that say they are ‘effective with both Gifted and Special Education populations’. And, I’ve always assumed that programs that claimed to be just as effective with each group didn’t work at all. Clockwise, however, does indeed work for all groups, serving the individual learning needs of each. This program has the potential to change the way American students learn fractions, decimals, percents, and degrees, and could shape instruction for the next century. This entry was posted in Uncategorized and tagged educational card games, nanobugs, whats your cosmo. Bookmark the permalink.